It was with great sadness that I learned this week that John Lees, Waverley’s’ Donkeyman of many years, passed away last week. John’s part in the story of the Waverley’s preservation era could fill a Dinosaur Down Below type book all by itself and I was lucky enough to work on the engine room when he was there. He was a very big part of my early days on the ship. It would be fair to say that for me, gaining his approval on the ship, along with that of Ken Blacklock, as a “junior apprentice stoker’s mate 3rd class”, was always the absolute pinnacle of achievement. Whilst his public face on the ship was that of a gruff, no nonsense individual who did not suffer fools or nutters gladly, any one who knew him at all well very quickly came to realise that this was a fairly thin veneer indeed. In writing this, if I were to try and come up with one word to some up John, it would be “kind”. Of course, I’m sure he would be horrified at such a dent in his image, but he always looked after us well, and if you put in the hours and the effort in the engine room then you got the nod of approval…quietly. His knowledge of the workings of Waverley’s machinery was far greater than he would ever let on, but on many occasions, when it was all going wrong I’ve seen the engineer of the watch turn wide eyed with barely concealed panic to John and he would point them to some valve, or pipe or pump that would make everything ok. He was also perfectly adept at driving the three-legger, but only if he absolutely had too! Despite the sadness since hearing of his passing, I have found myself smiling a lot in the last couple of days as I’ve been remembering John and surely that is a measure of the man. 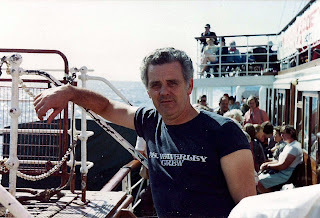 On my first ever summer holiday spell of working in the engine room as I didn’t have any suitable gear with me on the first day such a boiler suit or safety boots, I went along only as a passenger. Word had obviously got around the ship as to my impending change of career. Most of my contemporaries seemed a bit in awe that I was going to give it a go in the engine room. However when I wandered up the port alleyway, John Lees and Kenny Angell wasted no time in hurling encouragement/intimidation/abuse in my direction. John exclaimed that must surely be off my head and Kenny just roared with laughter at my discomfort to the extent that he had to hang on to the golden levers to stop himself falling over. John took great delight at blowing a good lungful of thick cigar smoke through the fan engine, in order to add a certain…something….to the air supply into the boiler room, to the outrage of the poor fireman down below. He had an ability to stand at the step onto the engine room platform and chat to someone beside him in the alleyway but seemingly never take his eyes off “The Job”, talking to you, over his shoulder, so to speak. John would grab a quick breath of fresh air at the sponson door outside the souvenir shop, cigar firmly in position where, just by coincidence you understand, he could spend a wee bit of time chatting to his wife Sandra who was in the shop. If John was our mentor, Sandra was frequently our agony aunt. I only recently learned of her passing and I will miss her too. They were a formidable team. 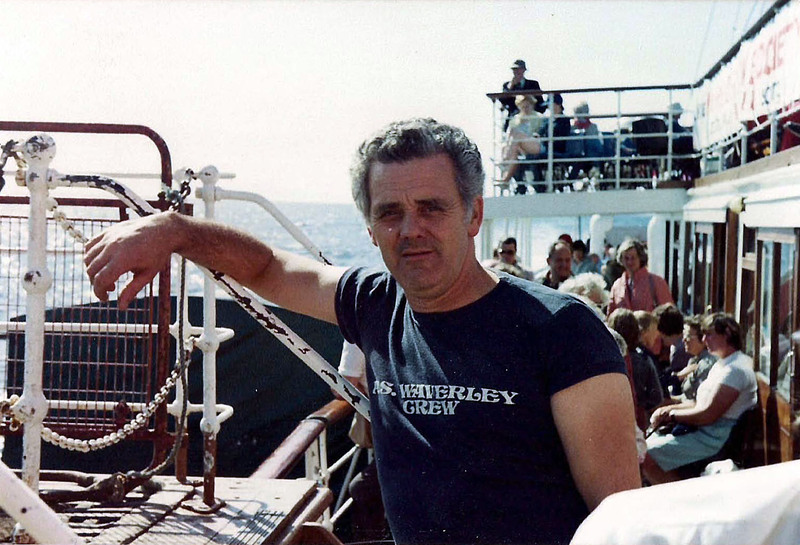 I remember him single handedly carrying a full size bottle of oxygen from the gas axe set from the main deck, up to the paddle box steps, at speed, to assist in the treatment of a passenger took gravely ill as we made our way up the Kyles of Bute one Saturday. I rose to the dizzy heights of second engineer at one point for a week , and on my first day, the chief, Andy Steele handed over the watch to me and set off down the alleyway. From behind me came a deadpan voice, “Can ah get you a coffee then……..chief?” I turned to find John making his usual offer to the officer of the watch (me!) and Wee Davie beside him was scarcely able to contain his mirth that I was sailing as second! It did seem completely surreal having sailed with these two characters so often, with me being “the boy”. “Aye, thanks John, that’d be great.” I replied hoping that I had given the right response. I won’t say anything like “Finished With Engines” as he never let on that he had much time for all of that. Though “Finished with Engineers” would probably have got a laugh out of him! John, you will be sadly missed; The Waveley has been and always will be a much poorer place without you. "Smile John!! - Ah am smilin........."